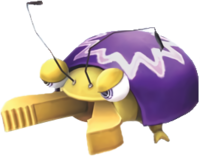 Mandibugs are enemies found in Super Mario Galaxy and Super Mario Galaxy 2. They are large, stag beetle-like insects that sport snapping mandibles which they use to attack and a broad purple body. Their dorsal side displays a Ground Pound sign, indicating that the enemies can be defeated in this way. Their name is a wordplay on the words "mandible", describing their powerful mouthparts, and "bug". In Super Mario Galaxy, Mandibugs infested the Honeyhive Galaxy and are led by Bugaboom. They are apparently unfriendly neighbors of the Honeybees, and they take over the Bees' observation tower in the mission Trouble on the Tower. They are initially stationary, but attack Mario or Luigi by charging and attempting to hurt them with their mandibles. Not far from their initial positions, they then stop and retrieve. One can be defeated by executing a Ground Pound on its back, causing it to drop many Star Bits. If simply stood on, Mandibugs will shake off the player after a few moments, leaving them briefly immobilized. Along with the Honeyhive Galaxy, Mandibugs appear in a handful of other locations, including the Honeyclimb Galaxy and on Airships. A Stink Bug Parent with an infant Mandibug appears when the player rides the windmill to the top of the tower in Honeyhive Galaxy. It gives up a Power Star when defeated. Mandibugs later appear in Super Mario Galaxy 2, where they appear in the Puzzle Plank Galaxy. Their leader, Bugaboom, makes a reappearance in the Puzzle Plank Galaxy's hidden Star. The Stink Bug Parent from the first game reappears during the mission The Puzzling Picture Block, with the exact same role but with a boss theme. ↑ Browne, Catherine. 2010. Super Mario Galaxy 2 Prima Premiere Edition guide. Page 28. This page was last edited on March 5, 2019, at 15:43.